28. How many baskets of flowers are you worth? 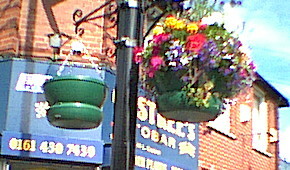 The council has decided to brighten Romiley up even further by adding summer flowers to the ranks of shiny new black lamp posts. 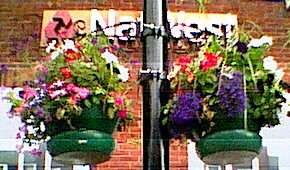 There seems to be a hierarchy of hanging baskets on the village's new lamps. 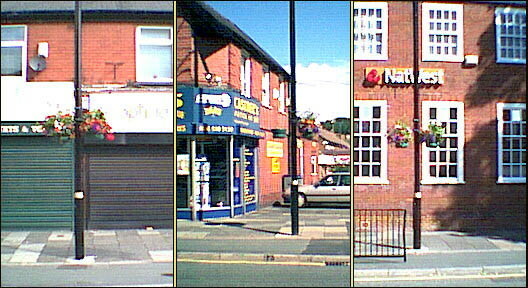 If the lamp is in front of a common car parts store (top, centre), only one of the baskets is filled with flowers. 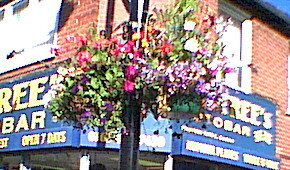 But if it's in front of somewhere important like an optician's (top, left) or a bank (top, right), both baskets are filled up. Since the above item was posted, the Triv-Dems have been shamed into coughing up some more flowers to fill the empty basket at the car-parts store. 30. Topped out at last. Cowboys can drag their feet only for so long. The new lamp at the western end of the zone has been fitted with a fancy top at long last. 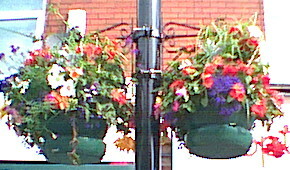 The summer hanging baskets on the lamp posts have been removed. 31. 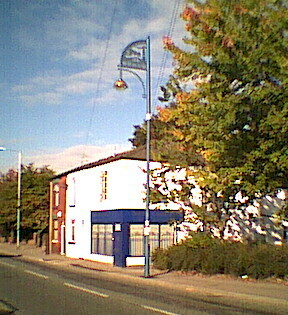 The western end of the New Lamp Zone. Of course, the newly topped-off pole is still wearing its white transport strips and the whole has yet to be painted in black with gold trim on the orb at the top and the street-level stripe. The area across Stockport Road has a bit of pavement now but it's still pretty much a disaster area. We seem to be getting there, but slowly. So anyone waiting for the matching lamp to be installed at this end of the zone is advised not to hold their breath! Created for Romiley Arts Federation by HTSP Web Division. © RAF, 2004.